First Line: Standing outside the Michelin-starred restaurant, a stone's throw from the Champs-Élysées, the old man patted his stomach. It's 1989. The Berlin Wall has fallen, and in Paris, Aimée Leduc is a pre-med student who lives with her father and sometimes helps him out in his detective agency. Things are not going well for Aimée. She's at risk of failing her studies due to sabotaged lab work. Her boyfriend is getting engaged to another woman, and her father leaves for Berlin on a mysterious errand. Since he did ask Aimée to help out in the office, she becomes intrigued-- and then obsessed-- with a murder that's linked to a transport truck of Nazi gold that disappeared in the French countryside during World War II. At first convinced that she was going to do the bare minimum to answer the client's questions because those fees are urgently needed, Aimée's investigation leads her further and further towards the truth... and her reaction gives her reason to believe that she may need to rethink her true avocation. For anyone who's followed Aimée Leduc throughout the course of her many investigations, this prequel is a welcome addition to the series, since it does answer several questions: How did Miles Davis join the family? How did she meet René? What did she do before she became a private investigator? 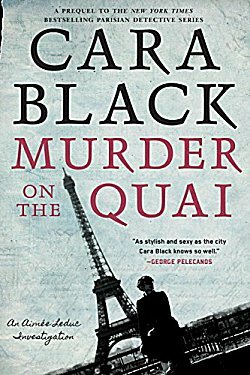 For anyone who's brand-new to the series, Murder on the Quai will be the perfect starting point. To be honest, I wondered how Black was going to follow up Aimée's first outing as private eye/mother in Murder on the Champs de Mars. Aimée has a penchant for getting into danger, and there are bound to be some readers who think she should stay in the office and out of the line of fire. This prequel avoids this issue for now, but it will be interesting to see how Black deals with it in future books. Murder on the Quai is fast-paced, and the occasional "flashback" chapters to 1942 up the tension and suspense. Who's killing these old men? Why? And... what happened to all that gold? This latest book by Cara Black is a first-rate whodunit that showcases Aimée's natural deductive talents. She does make mistakes, and even though she is intuitive, she is a rookie after all. It's going to be fun to see which direction Black takes her series in next! I'm so glad you featured this one, Cathy. I've been wanting to put one of Cara Black's mysteries in the spotlight for a long time, and I keep, well, not doing it. Thanks for the reminder.